Only if you have room though. While the kid is a stud and has performed at all levels, it is very hard for a rookie to come in and excel at the Major League level right away. The return however is well worth the risk of getting rid of your worst player on your team. Little is known what will happen when Victorino comes back, but if Brown performs then the only thing they can do is leave him. 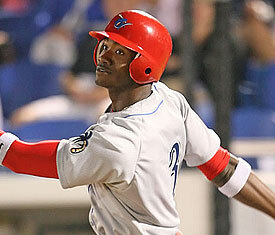 He had 20 HRs at the Minor League level and had 17 SBs while hitting .327.